GOKPOP | Exclusive K-News in Malaysia & Singapore: Now Everyone Can Fly... to JEJU! Promotional fare start at rm249* one way. Now Everyone Can Fly... to JEJU! Promotional fare start at rm249* one way. The award-winning long-haul low-cost carrier AirAsia X has made its maiden entry to the South Korean Island of Jeju on 12nd December 2017 following the successful landing of flight D7 501 on Airbus A330-300 at Jeju International Airport, making it the only airline with DIRECT CONNECTIONS between Kuala Lumpur and the beautiful largest island off the coast of the Korean Penisula. 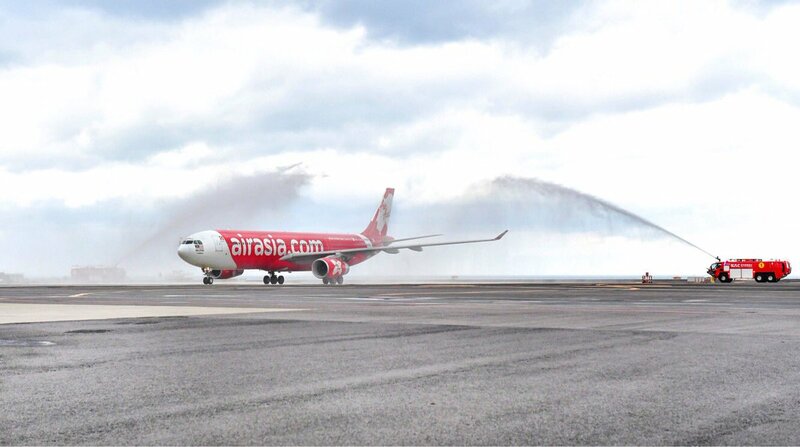 Jeju island is AirAsia X's third destination in South Korea after Seoul (Incheon) and Busan. 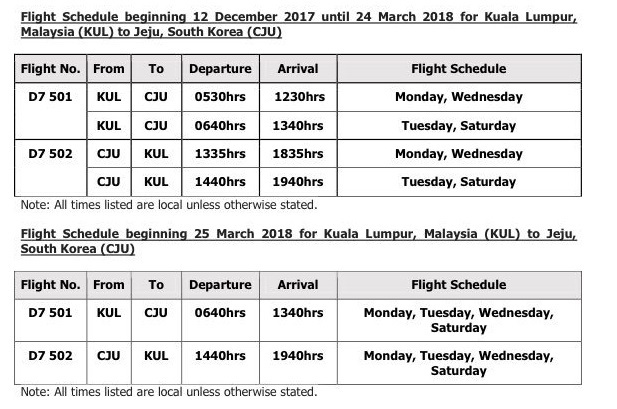 This latest route will also strengthen the AirAsia and AirAsia X Group position in South Korea market by having a total of 75 weekly flights and 1,183,468 capacity a year for one way flight. In conjunction of this latest destination inaugural flight launch, AirAsia X is offering promotonal all-in-fares from RM249* one-way on standard seats and available for booking on airasia.com from 13th December 2017 until 19 December 2017 for travel between 16 December 2017 to 27 October 2018. The award winning Premium Flatbed is also available for booking at promotional all-in-fares from RM799*. 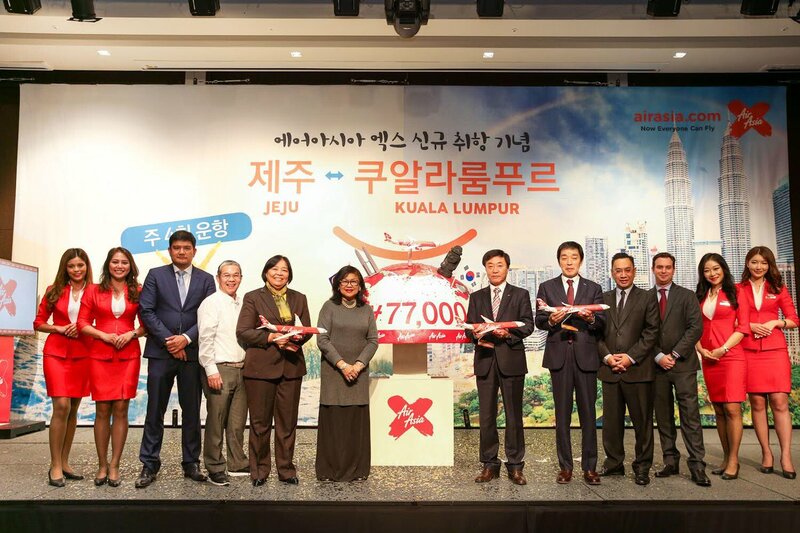 Commenting on the inauguration of this exclusive route, Chairman of Airasia X Malaysia, Tan Sri Rafidah Aziz said, "This direct flight from Kuala Lumpur to Jeju has the potential of generating a capacity of over 156,000 a year between Kuala Lumpur and Jeju while saving our guests a great deal of hassle for domestic transit. Our guests will now have the convenience of the direct non-stop flight to experience Jeju's beautiful landscape and nature, culture and heritage as well as leisure activities." In a welcoming speech, Won Hee,Ryong, Govenor of Jeju Special Self-Governing Province, said: "Together with Jeju citizens, I'm pleased that AirAsia X operates direct flights between Jeju and Malaysia. And I hope that the two nations will experience a growing number of travelers while expanding exchange and cooperation for joint prosperity. Truly hoping that Malaysia and Jeju will build a lasting friendship, the Jeju special self-governing province will actively support this." Jeju is a beautiful volcanic island located 64kms south of the Korean Peninsula. It is the country's most popular holiday island and home to the UNESCO World Heritage Site "Jeju Island and Lava Tubes" which consists of Mount Halla, the highest mountain in South Korea and a dormant volcano, Geomunoreum lava tubes and the dramatic landscape of Seongsan Ilchubong tuff cone. Other attractions include the scenic Jeju Olle Trail, the breathtaking Cheonjiyeon waterfall, Hyeopjae beach and many special themed museums, making Jeju a destination for all ages all-year round. * Promotional all-in-fares quoted are for one-way travel only inclusive of taxes and fees.